Outfit your soccer team with this short sleeve Puma Hooped Jersey! Red/white horizontal stripes and three PUMA cat brandings offers your team the classic look of the hoop. 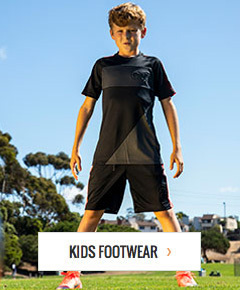 This PUMA Hooped Jersey offers soccer players a short sleeve jersey with innovative performance fabrics designed for play, no matter what your soccer level may be. This Hooped Jersey by PUMA features a heat transfer application and an innovative sleeve design and construction to keep your body cool, even during the most intense heat. The red/white striped design is a classic look that never goes out of fashion. With top national soccer teams such as the Azzuri sporting PUMA, you know you are in good company. This classic, Hooped Jersey features three PUMA cat brandings, two on the sleeves and one on the front, which adds to the classic look and mystique. This PUMA red/white Hooped Jersey is made from a polyester double knit pique shell fabric to keep you comfortable during the entire soccer match. Thanks to polyester warp knit mesh panel side inserts and a crewneck collar, the heat won't slow you down during an intense match in the heat.